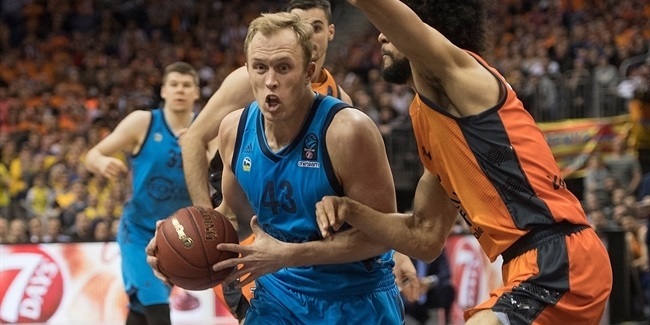 For fans of high-scoring basketball, the series between ALBA Berlin and Unicaja Malaga is your ticket. Group E winner ALBA (87.4 ppg.) enters the quarterfinals ranked second in the competition in scoring this season and Group G runner-up Unicaja (86.1 ppg.) is third. ALBA swingman Rokas Giedraitis was the Top 16's leading scorer (15.3 ppg.) and guard Martin Hermannsson ranked third (14.7 ppg.). Giedraitis's 233 total points scored this season is third-most in the competition and with 6 points more he will be this season's leader since the two players ahead of him (Elmedin Kikanovic of AS Monaco and Joe Ragland of Crvena Zvezda mts Belgrade) did not advance to the quarterfinals. Unicaja center Giorgi Shermadini is eighth – and third among quarterfinalists – with 206 points scored. 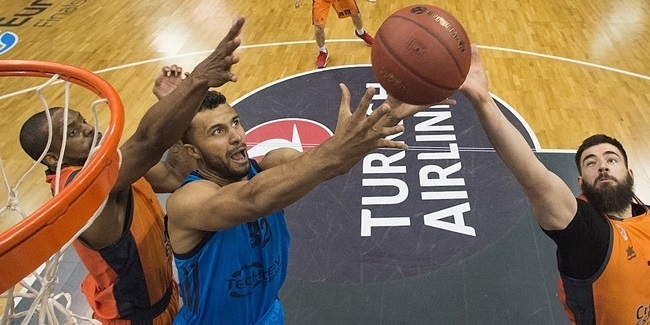 Shermadini is the top EuroCup scorer on a per-minute basis with an average of 27.5 points prorated over 40 minutes. While both ALBA and Unicaja are among the top offenses in the EuroCup, they get their points in different ways. Unicaja likes to go inside to its big weapons, Giorgi Shermadini and Mathias Lessort, who have their team leading the competition in two-point accuracy (59.4%). However, ALBA actually attempts nearly 10 more two-point shots per game (42.9) than Unicaja. Several of those come in transition or fast breaks because ALBA leads the EuroCup with 9.1 steals per game. Others come thanks to ALBA's 12.1 offensive rebounds per game, which is fourth in the EuroCup. Unicaja is 21st – and last among quarterfinalists – with 5.5 steals per game. ALBA ranks fifth in three-point accuracy (41.1%), buts its 23.4 threes attempted per game are 4 shots fewer than Unicaja, which is in the middle of the pack when it comes to accuracy at 37.7%. Coach Aito Garcia Reneses of ALBA also spent three seasons on the sidelines at Unicaja, from 2008 through 2011. It was a successful run for Unicaja, including an appearance in the 2009 Copa del Rey title game, where they lost in overtime against Baskonia Vitoria-Gastiez. Unicaja sporting director Carlos Jimenez played under Aito on those teams as well as on the silver-medal winning Spanish national team at the 2008 Olympic Games. Aito coached current Unicaja player Sasu Salin at Herbalife Gran Canaria during the 2015-16 season. Unicaja swingman Dragan Milosavljevic spent two seasons with ALBA before he joined Unicaja in 2017 and helped the club win its most-recent trophy, the German Cup in 2016. He was a teammate there of current ALBA players Niels Giffey, Peyton Siva and Tim Schneider. Unicaja guard will feel familiar in Germany, too. He won three German championships – including two league and cup doubles – during a three-year run with Brose Bamberg from 2009 to 2012. Unicaja is 3-2 all-time in EuroCup games in Germany. The last time these teams met, Unicaja edged ALBA 83-77 in Round 5 of the 2016-17 Top 16 to clinch a berth in the quarterfinals. Kyle Fogg scored 20 points on 4-of-5 three-point shooting and Nemanja Nedovic added 16 points. Unicaja placed second in its Top 16 group and went on to win three straight series without home-court advantage en route to capturing the EuroCup crown. Unicaja also bested ALBA 69-77 in the Top 16 opener. The team's playoff run began in Germany too. Unicaja lost Game 1 of its best-of-three series against FC Bayern Munich 91-82, but then won Game 2 at home and took the third-and-deciding contest in Munich 69-74. Five current Unicaja players – Alberto Diaz, Dani Diez, Viny Okouo, Carlos Suarez and Adam Waczynski – played on that team. ALBA forward Luke Sikma was on the Valencia Basket squad that lost to Unicaja in that season's EuroCup Finals.